It has been so long! Wow. Not even sure if anyone is reading anymore, considering my terrible rate of updates! I have missed writing though, and so I’m happy to take the opportunity. Salim is the guy looking at the camera with his fist in the air and I am (a bit harder to find) to the right of him. The first photo, of Bono, was actually taken from where we stood during the show! Just like every U2 show, it was out of this world. Equal parts fun and powerfully moving. I was lifted off the ground along with the tens of thousands of other fans. A night to remember. After that night I thought it pretty much had to be downhill from there…instead, it was only the beginning. Earlier in the month I was emailed about an opportunity to volunteer for the ONE Campaign at the U2 show. 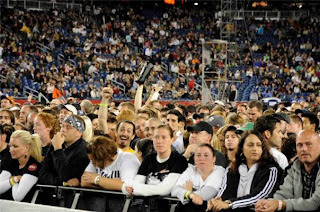 I, of course, ecstatically signed up for the next night at Gillette. Two nights in a row of U2 – does life get any better? Yes! I volunteered throughout the day, signing people up for the ONE Campaign. 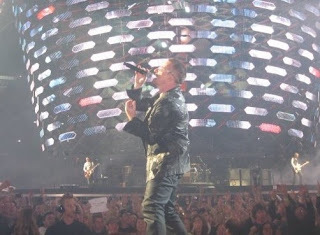 Only four years ago, I discovered the ONE Campaign to Make Poverty History, at a U2 concert. Now it came full circle and I had the opportunity to recruit. Very cool. AND I got to watch the show from inside the circle this time, even closer to the band. But I still haven’t reached the climax of my U2 experience. Because as ONE volunteers we got to PARTICIPATE IN THE U2 SHOW! Yes, I had to use caps to say that – it’s the only way, I’m sorry. I got to go on stage with the greatest band in the world and my hero. I’m still smiling. So allow me to elaborate on this experience (as if I haven’t gone on long enough already)! The song Walk On is dedicated to Aung San Suu Kyi, who has been a political prisoner in Burma for almost twenty years. One of the world’s most oppressive governments has kept her under house arrest because she won a democratic election and they decided that couldn’t happen. She was awarded the Nobel Peace Prize and U2 is trying to give more attention to this amazing woman, in hopes that the international community will be able to set her free. During this song, the band asks that everyone wear a mask of Aung San Suu Kyi’s face, that was handed out. Meanwhile, I am back stage with volunteers from ONE and other organizations preparing for our part. I’m standing, listening, in total shock – about to literally pee myself. Bono asks for the volunteers to come out (our cue), we walk out onto the outer circle of the stage, lining up, looking out into a sea of over 60,000 people, and we hold the masks over our faces. I can feel the music pulsating behind me. It is a truly poignant moment for the entire stadium full of people. I am proud to stand for Aung San Suu Kyi. And this is why I so totally love U2. Their music is action. It’s a soundtrack to life; not one that simply plays along, but instead one that demands more of us. It was one of the most incredible moments in my life. Against the backdrop of my battle and victory with cancer, it is made all the sweeter. I feel so completely blessed and I am eternally grateful for all that I have. Hey John! I am thrilled for you too! WOW!!! What an experience….I can see it all in my mind and I pause in awesome wonder…..wow! I am thrilled for you and wish I could have been there too….what a night! We are blessed John…..life is challenging at times as we both know, but it is still what our Blessed Lord gives us…..an opportunity to make a difference and to love others….isn't that a grand and glorious calling? WOW! His Grace & Love & Joy! P.S. My best to your family and all your loved ones….I miss you all. I am truly happy for you and greatful for a band that stands for something good. To that, I give you a great band!